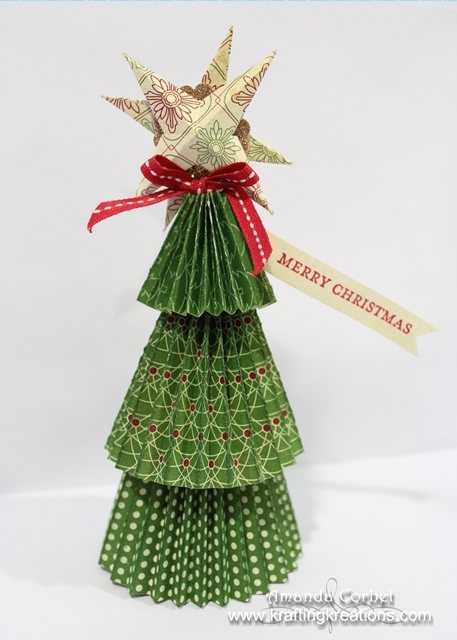 How cute would it be to have one of these lovely little Christmas trees as name place cards at your next holiday party? 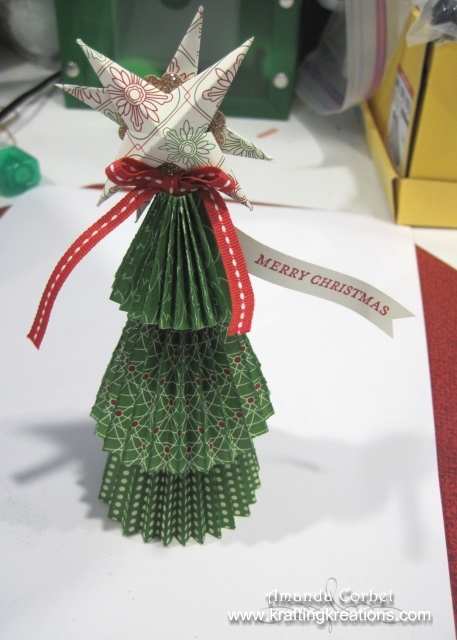 They are pretty simple to make and oh so cute! This sweet little tree is ** inches tall. Now here is how you make it! 1. 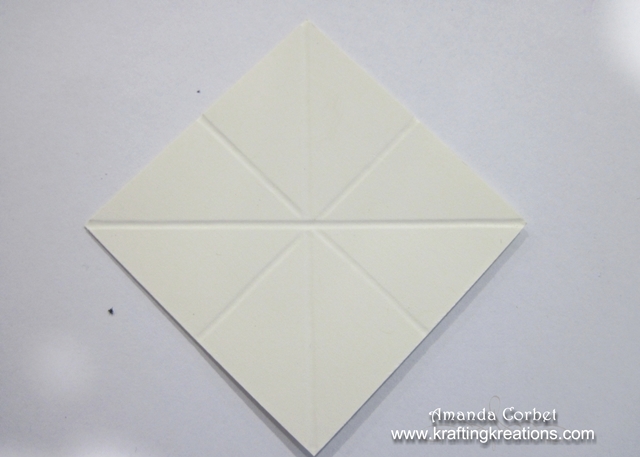 Cut one piece of DSP 4” x 12”, one piece 3-1/2” x 12”, and one piece 1-1/2” x 12”. 2. With the 12” side of your DSP at the top of your Simply Scored, score at 1/4” along the entire length of all three pieces of DSP. 3. Place a piece of Sticky Strip on one end of the paper. 4. 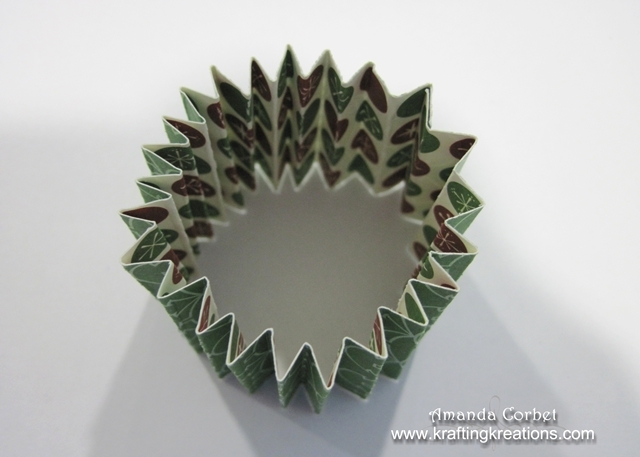 Fold the paper up accordion-style. 5. Remove the liner and adhere it onto the other end of the DSP creating an accordion loop of paper. 6. Now this part is just a little tricky. I held my paper loop over the top of a bottle and pinched one end together tightly, applied a little hot glue on top of the point and held the top of the paper together until the glue set. Repeat this for the 3-1/2" tall piece of DSP. 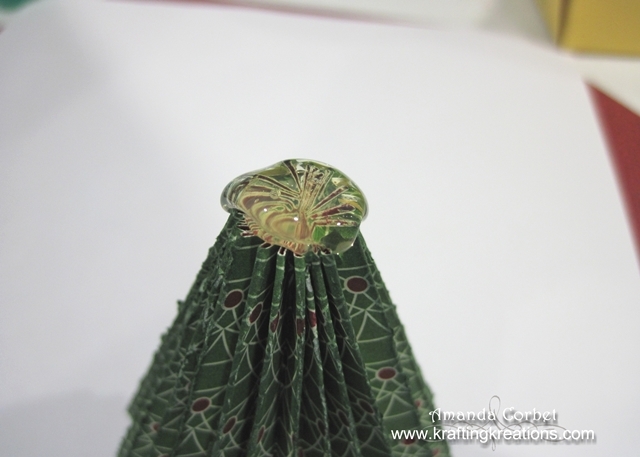 Now sponge the ridges of your tree with a Stampin' Sponge and Garden Green ink. 7. 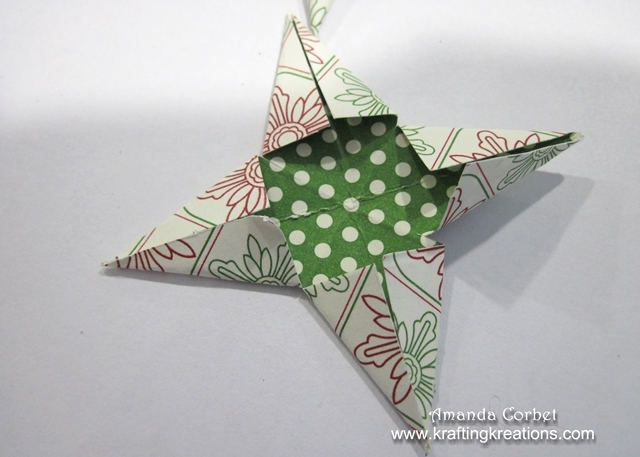 For the star I cut two pieces of DSP 2” x 2”. 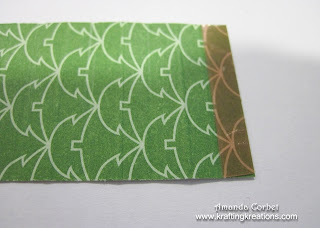 Score at 1” on both sides of the card stock, then score from corner to corner on both corners. Your DSP should be scored like this. 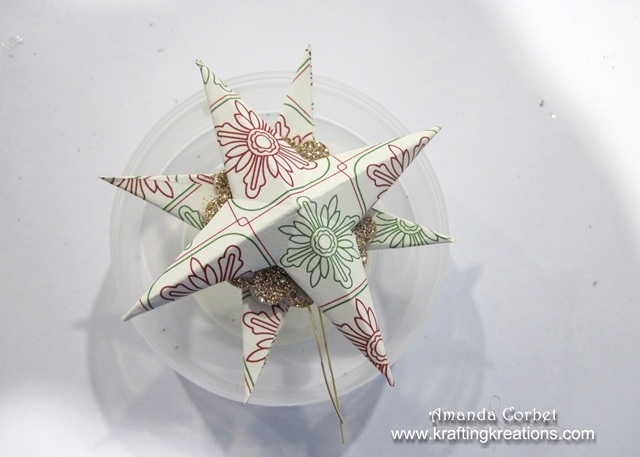 (The idea for the star came from Jenni at Pauline's Papier. 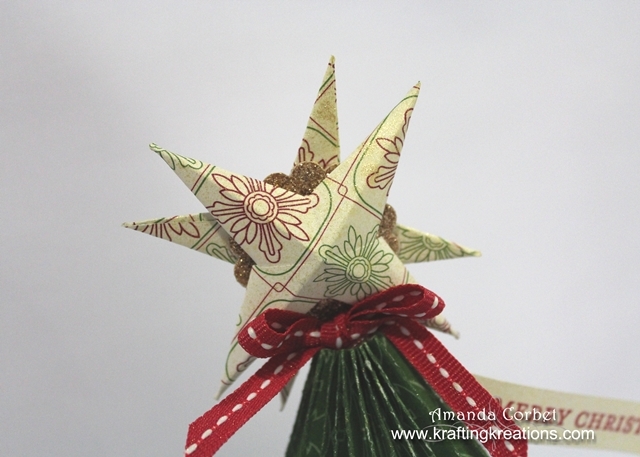 She has a wonderful video HERE that shows you how to make the star. But here is the cliff-notes version in English). 8. Fold on all score lines. Now cut a slit half-way up the score line in the center of the sides on all four sides. 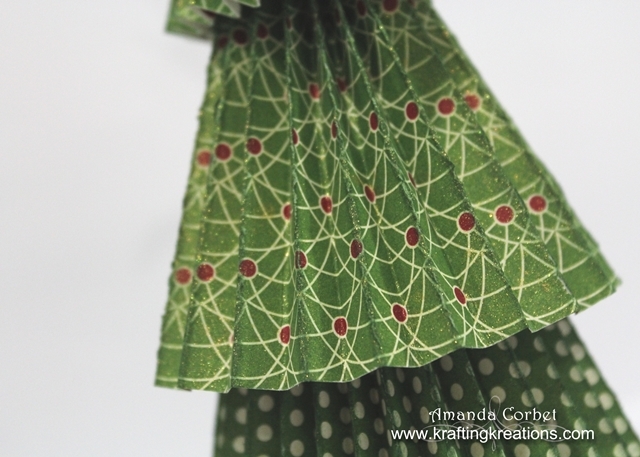 Now fold the paper up so that it lines up with the center score line of the point. Repeat on the remaining three points. 9. Now with just a tiny drop of Multipurpose Liquid Adhesive glue one flap of the point behind the other flap. This makes the point three dimensional. Repeat on the other three points of the paper. Repeat to make a second star. 10. 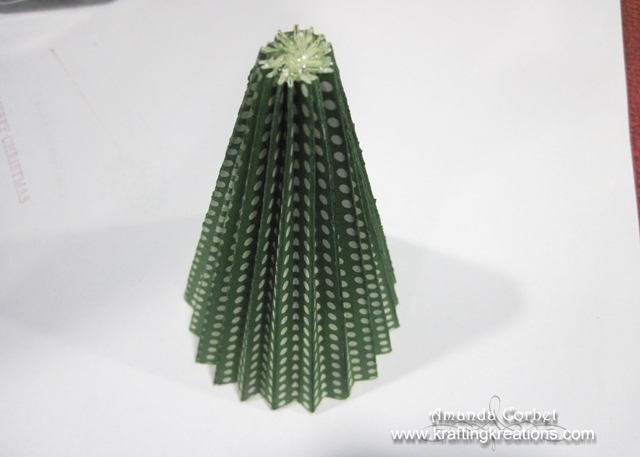 Use the 1-1/4” Scalloped Circle punch on a piece of Champagne Glimmer Paper twice. Adhere each glimmer circle behind the DSP star with a little Multipurpose Liquid Adhesive. 11. 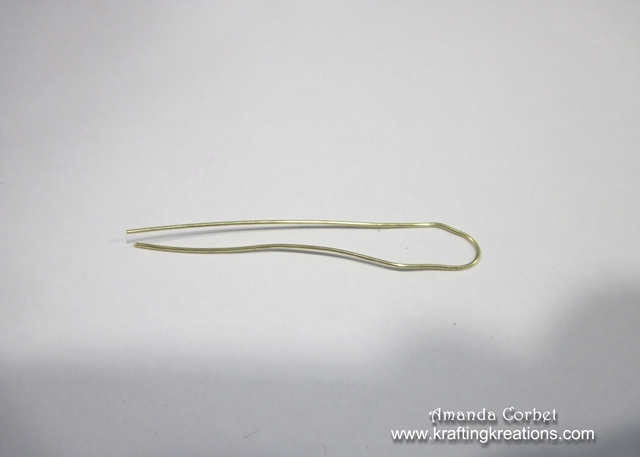 Cut a length of wire 3" long. It doesn't have to be very thick wire. 26 gauge or so would work just fine. Fold the wire in half. Apply a lot of glue in the center of one of the glimmer circles. 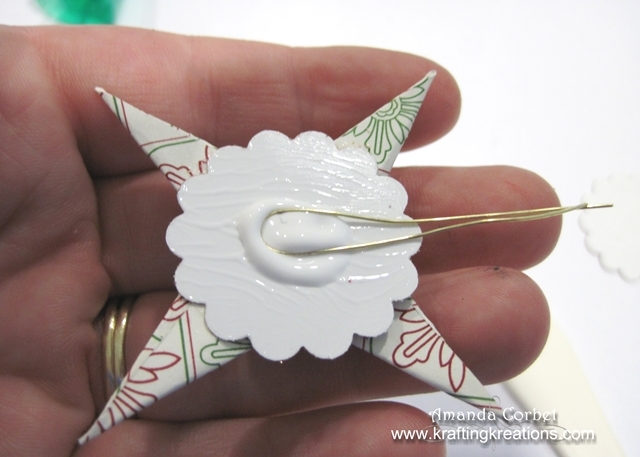 Add the wire in the glue, the press on the other star/glimmer scalloped circle. Allow this to dry for about 10 minutes. 12. Take a length of Real Red Stitched Grosgrain Ribbon about 18 inches long. Tie a bow around the wire that sticks out beneath the star. 13. 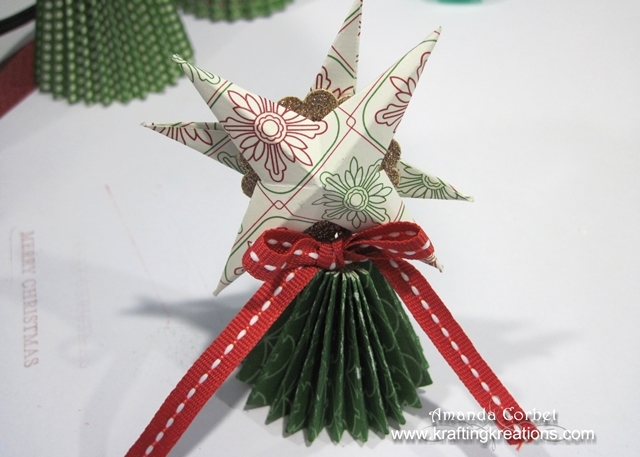 Now hot glue the end of your 1-1/2" tall accordion loop just like you did for the bottom two layers in step 6 but insert the wire for the star before the glue is set and then hold the top of the paper in place until the glue is set. 14. Now add a large glob of hot glue on the top of the tallest cone. Add the middle cone on top of the largest cone. 13. Add a large glob of hot glue on top of the middle cone. Add the smallest cone on top of the middle cone. This forms your tree. 14. 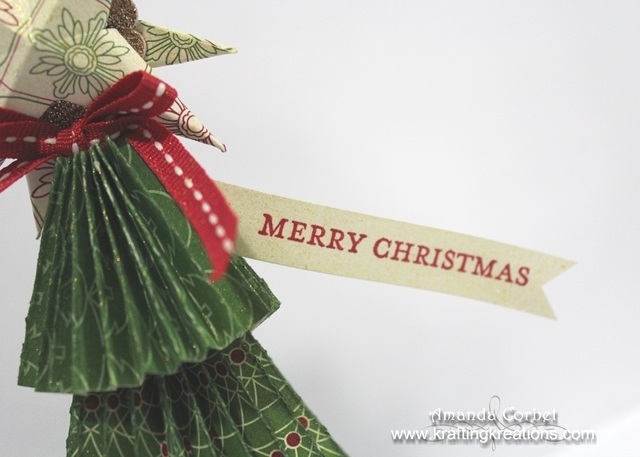 Now stamp your greeting, or print your names onto a piece of Very Vanilla card stock. 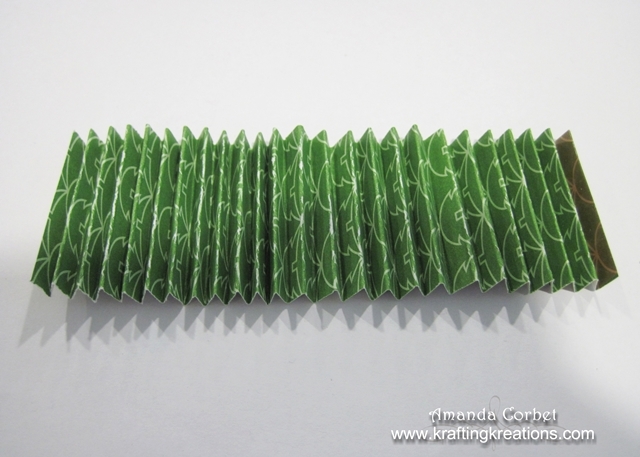 Cut them into strips and use Paper Snips to cut the left end into a sharp point. Now add just a tiny bit of hot glue onto the backside of the pointed end of the strip and adhere it between two of the "fins" on the top portion of the tree. 15. To add some shimmer spray the tree several times all the way around with Gold Smooch Spritz. 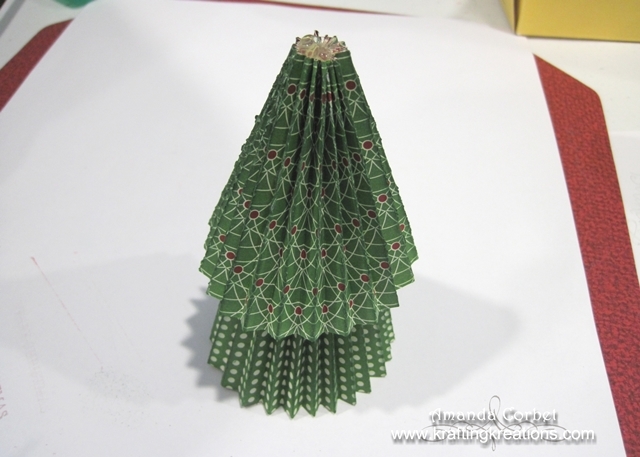 Your cute little Christmas tree is done!